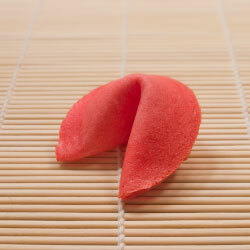 Experience our collection of gourmet flavoured fortune cookies. From strawberry to chocolate, we surely have the flavour to please your taste buds. Our gourmet flavoured fortune cookies are perfect for parties and special occasions and can come with a personalized message. Our cookies are baked fresh to order and come individually wrapped in clear cellophane. Interested in further customizing your cookie's message with a photo or graphic? Contact us to learn more.